You are permitted to transfer your ScrapeBox license to another PC once per calendar month for free in case you get a new PC, re-install Windows etc. To do this simply download the latest ScrapeBox version to the machine you want to install it on using one of the links below. When you run it the “Activate ScrapeBox” window will popup, just enter your payment details. Note: Please ensure you use “exactly” the same Name, Email and Transaction ID as you did when you originally activated ScrapeBox. Failing to provide the correct details may delay your license transfer. 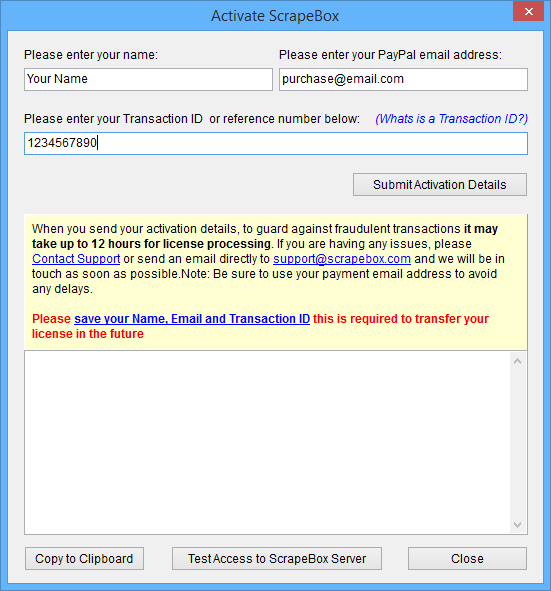 Then just click “Submit Activation Details” and ScrapeBox will send your activation details in order for us to deactivate your existing license and move it to your new machine or Windows installation. If you have already reset your license this calendar month and require an additional transfer please see the Additional License Transfers page. Sit tight, we will reset your license as soon as possible and send you a confirmation email when this is complete.